Video: Watch as the Guinness World Record announcement is made! I crossed setting a Guinness World Record off my bucket list on October 19, 2013, and so did my daughter at the tender age of 10! Of course, we had a bit of help. We carved only two of the 30,851 pumpkins that enabled Keene, New Hampshire, to reclaim the title of Jack-o-lantern Capital of the World. As you'll see in these pictures, it was a mind-boggling achievement to amass these grinning, glowing, one-of-a-kind gourds along Main Street and to keep them lit during the 5-minute period when a Guinness adjudicator-led team certified the count. An hour later, we inhaled the scent of warmed pumpkin and held our breath as Mayor Kendall Lane revealed the record-smashing total: a number more than 31% greater than the entire population of Keene! The vibrant little city is no stranger to jack-o-lantern glory. Keene set its first world record for the most intentionally carved, lit pumpkins in one place at one time with just 1,628 jack-o-lanterns during the second annual Keene Pumpkin Festival in 1992. Over the next decade, the Keene Pumpkin Festival raised the bar repeatedly, setting an eighth Guinness World Record in 2003 with 28,952 jack-o-lanterns. Then came a 10-year drought. What happened? Keene relinquished its place atop the pumpkin heap to New England rival Boston, which hosted its one and only attempt to set a world record in 2006. The 30,128 jack-o-lanterns compiled on Boston Common stood as the untouchable record for years. Keene tried annually but fell short. In 2013, bolstered by the colossal donation of 20,000 pumpkins by C&S Wholesale Grocers, the Keene Pumpkin Festival took serious measures to reestablish its pumpkin preeminence. We were so impressed by organizers' efforts to meet Guinness's stringent rules. And we'll never forget how we shouted and celebrated with the crowd when the new record was announced. Ruth Sterling, who owns the festival's former management company, STERLING Design & Communications, said the magic of that moment was like taking the "best feeling in the world and multiplying it by 30,581." The Keene Pumpkin Festival is sadly no more, but the Guinness World Record set in Keene in 2013 has yet to be eclipsed. Since 2015, the event has been replaced by the New Hampshire Pumpkin Festival in Laconia, which carries on many of the traditions established in Keene. Be there on October 18 and 19, 2019 to experience the artistry and magic of this pumpkin extravaganza, or make plans to attend one of the other top pumpkin festivals in New England. My daughter was proud of our two contributions to the record-setting total number of jack-o-lanterns at the 2013 Keene Pumpkin Festival, especially the pumpkin on which we traced her hands. When we arrived in Keene, New Hampshire, around 1 p.m. on Pumpkin Fest day and logged in our pumpkins, it was already tough to find spots for them on the Main Street displays. Keene Pumpkin Festival volunteers went to incredible lengths in 2013 to ensure pumpkins were in position in time for the official Guinness World Record count. The people-watching was almost as much fun as the pumpkin-watching at the 2013 Keene Pumpkin Festival, which attracted a colorful assortment of characters like the Headless Horseman and these pumpkinhead men. I had seen photos of the Keene Pumpkin Festival tower from previous years, but they failed to prepare me for the enormity of this structure: the festival's centerpiece. You'll get to see this tower of glowing faces if you attend the New Hampshire Pumpkin Festival in 2019. What you're seeing here behind the alien is a display of about 75-100 jack-o-lanterns. Now, multiply that in your mind more than 300 times for a sense of how many pumpkins were assembled. Pumpkins stretched out in every direction along Main Street in Keene, New Hampshire. And the creativity on display was nothing short of amazing. I found ideas for unique pumpkin carvings everywhere I looked. Even some of the simplest pumpkins oozed originality... like the jack-o-lantern with onion eyeballs and a banana gourd tongue. 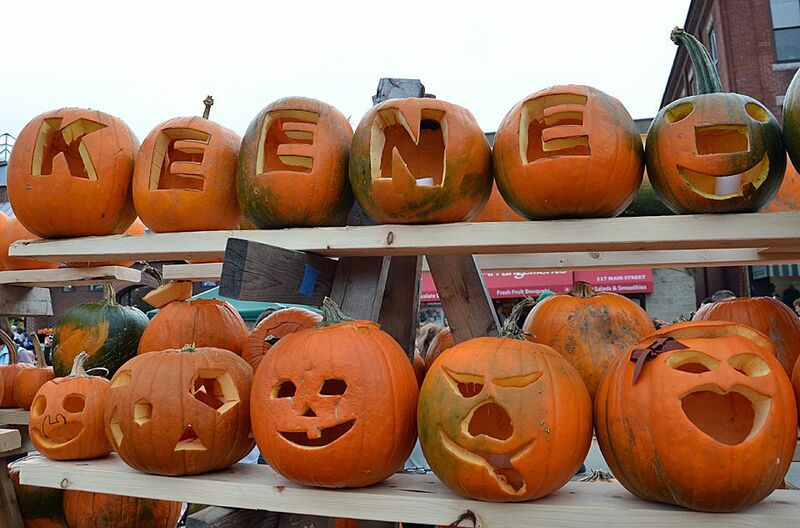 The 2013 Keene Pumpkin Festival featured other fun activities including Pumpkin Bowling. My daughter rolled a strike with her first pumpkin! We're stealing this idea for her October birthday party. The lighting of the pumpkins began at 4 p.m., creating a magical scene at twilight. It was critical to keep pumpkins lit during the official count at 6:50 p.m. Any jack-o-lantern that had gone dark was subtracted from the total. With its hundreds of pumpkins illuminated at night, the Keene Pumpkin Festival's grand tower is truly a jaw-dropping sight. Companies and individuals were able to reserve tower space free, but donations were gratefully accepted. Because each jack-o-lantern had to remain lit for it to count toward a new Guinness World Record, the crowd had to be vigilant. My husband resuscitated several burned-out pumpkins as the official count time approached. When I took this photo, we did not yet know if Keene, NH, would indeed achieve a new Guinness World Record for lit jack-o-lanterns in one place. BUT, thousands of gleaming gourds were grinning in anticipation of good news anyway! We did it! After overhearing two men postulating that the number of pumpkins was down from last year, I had my doubts, but when Mayor Kendall Lane announced the total—30.581—the crowd went wild. They knew instantly Keene had finally bested Boston. There were plenty of Keene Pumpkin Festival mementos for sale at Pumpkin Shops throughout the festival, but the best souvenirs were are own carved pumpkins, which we brought home world champions. My mother-in-law has proudly adopted the cat pumpkin and can't wait to tell her book club.